"Civil Discourse and the Politics of Confrontation in America" will bring together at Emory University in Atlanta a panel of nationally known political commentators and public scholars at 4 p.m., Monday, Nov. 8 to discuss how universities can help foster public and scholarly dialogue, and how that dialogue is affected by mass media and political divisions. 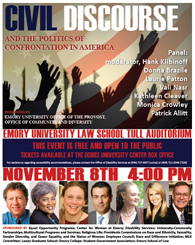 Panelists include political analyst Donna Brazile, TV and radio commentator Monica Crowley, Emory civil rights scholar Kathleen Cleaver, Emory religion and conflict scholar Laurie Patton, international politics scholar Vali Nasr and Emory historian Patrick Allitt. Moderator will be Emory Pulitzer Prize winning journalist Hank Klibanoff, James M. Cox Jr. Professor of Journalism. The group will discuss civility on campus and in the classroom, and whether it is compromised by media and public attitudes. They’ll also talk about the relationship between scholarship, debate and an informed electorate. Panelists will provide opportunities for opposing viewpoints and allow audience members to consider the nature of public discourse in America. The event will examine the role that universities can and do play in the development of political ideas and intellectual freedom, and acknowledge the complex relationship between education and civility, media interests and scholarship. The event will be held at Emory Law School’s Tull Auditorium, 1301 Clifton Rd., Atlanta, GA 30322. Admission is free, but tickets are required, and are available at the Dobbs University Center box office on campus, 605 Asbury Circle, Atlanta, GA 30322, or by calling 404.727.2616 for more information.